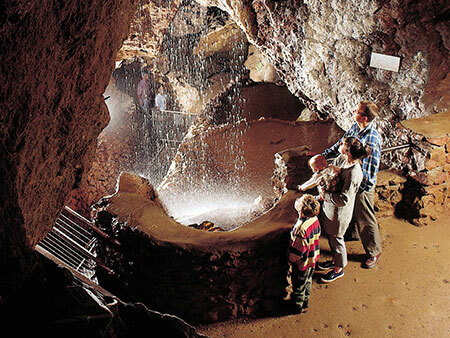 The show caves are a part of an extensive natural cave system, mined for iron ore to make one of Britain’s most complex and oldest mine workings; dating back well over 4,500 years, when Neolithic miners dug for ochre pigments. 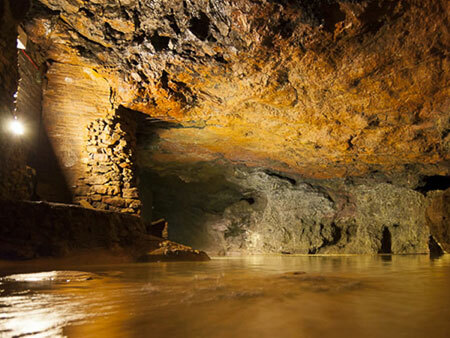 Nine atmospheric ancient caverns are open to visitors, that have an exciting and intriguing past. You will see why television programmes like Dr Who and Merlin have chosen to film here. Walk through intriguing, sometimes eerie, iron ore workings and tunnels, following in the footsteps of generations of miners, who cut their livelihood from the rock. Surface walks around Clearwell Meend (large common) and into historic and picturesque Clearwell village, with beautiful church and impressive village well (Clearwell Castle - not open to the public) 3 good pubs and 2 good hotels. A friendly welcome, great coffee and a wide range of high quality speciality teas make the Cafe worthwhile even if not visiting the Caves. 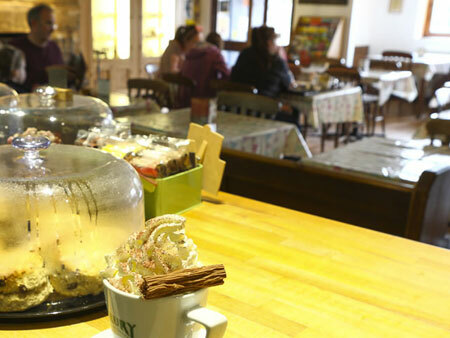 They sell a selection of delicious award winning cakes, homemade soups, light meals and snacks. 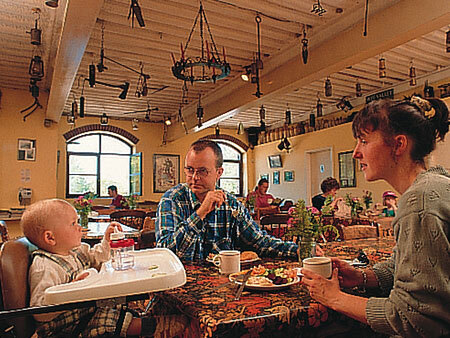 During colder weather, a real log fire makes the cafe very welcoming. Our Cave shop sells a wide range of gifts, beautiful mineral and silver jewellery, books and stones from around the world, as well as minerals and ochre from the caves. 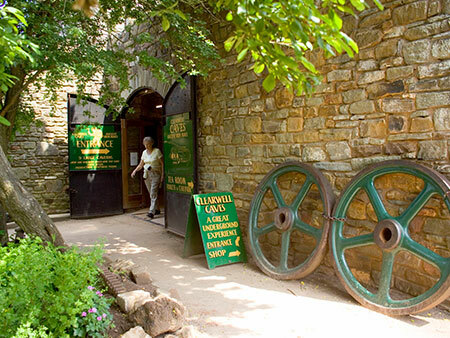 Clearwell Caves are now a working mining museum where visitors can see impressive caverns with geological and mining displays. Iron ore from the Caves has been used over many centuries to make tools, weapons and machinery. 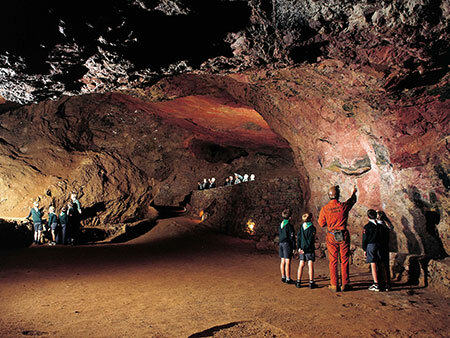 Some forms of the iron ore occurs in powder form, red, yellow, purple and brown ochre; they are highly valued as pigments and still mined at Clearwell Caves. The iron mines are an important part of the Forest of Dean’s history and environment. We have been introducing visitors to these fascinating and complex abandoned workings for over 40 years. 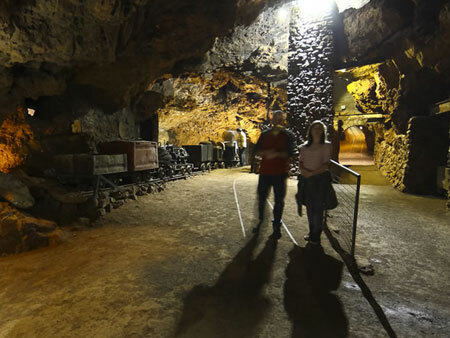 Curiosity about the workings has encouraged people to return again and again, venturing further into this extensive and atmospheric mine system. The trips are a great adventure for any group. If your group has a sense of adventure and wants to experience an exciting, real caving activity, our Deep Level visits offers physical challenge combined with spectacular mine workings and a fascinating history. Deep Level trips can be for adventure, education or both; the trips create a real sense of achievement and build self esteem, they are also a good way for families, new classmates or work colleagues to get to know each other better; working together as they descend into an unfamiliar and uncompromising environment. Groups are led by well trained and experienced mine leaders, holding site specific assessments from British Caving Association assessors. 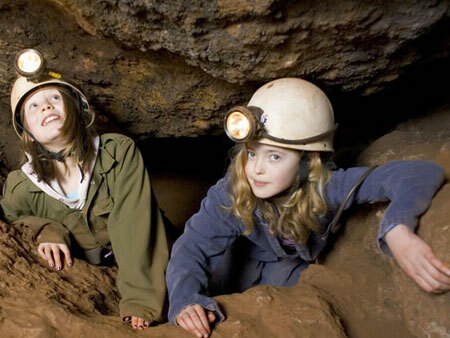 Clearwell Caves are licensed by the Adventure Activities Licensing Authority (AALA), for adventure activities with young persons (for caving and mine exploration) AALA licence number L12105/0009. Traditional field campsite at the Caves. Lovely location, tap, portaloo, dogs on leads. The site is tranquil, we are accepting tents only with parking in the nearby Clearwell Caves carpark. The cost is £7.00 adult £5.00 children (5-16). Per night. Bookings can be made via the onsite cafe, or call for more details.